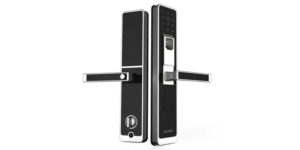 A smart lock is an electronic lock that is opened and locked with the help of an electronic key, a smart phone or remotely with the help of a sent command. to be controlled remotely from a smart phone via Wi-Fi. 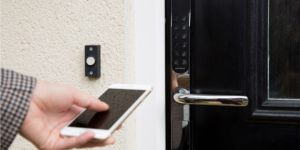 Almost in all cases a smart lock can be built in the home automation system, allowing it to interact with other intellectual devices. For example, it can be controlled with a voice via Siri. It locks the door with the help of an electromagnet. The magnet is installed in the door jamb, a metal plate is attached to the door. Power is supplied to the magnet that goes to a relay. To open the lock a user is to hold an electronic key to the reader. When it is done, the lock opens the relay. Locks can additionally be opened from a smart phone with a help of a command. Such locks are suitable for offices, emergency exit doors. This type of lock can be opened with both a mechanical and an electronic key (opening with a command, sent from a smart phone is also supported). The construction looks like a regular lock but with a device to open the latch. A motor or as an actuator is used as such a device. 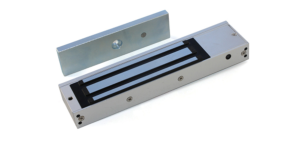 This type of lock is characterized as highly reliable, because even if there is no power the lock stays closed. And it can be opened with a mechanical key in case of emergency. This lock is opened when a correct code is entered. It can be locked by either an electromechanic latch or an electromagnet. The additional advantage of this lock is a capability to do different actions when a wrong code is entered. For example, a camera can be turned on or a signal to security service can be sent if a wrong code is entered 3 times in a row. This type of locks does not have any visible readers of key-holes. The lock is opened when an electronic key appears in the working zone of a hidden reader. 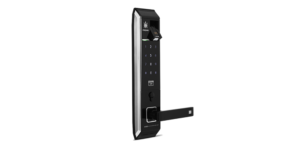 The advantage of the lock is the autonomous power system that allows to lock to work several days without power supply. This type of lock is installed in places where increased security is required. It is opened with a finger print registered in database beforehand. 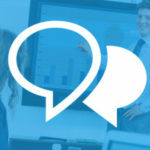 The disadvantage of such a solution is that guest access can’t be given fast. 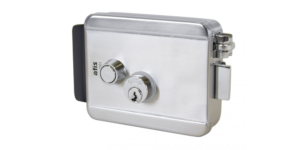 Locks of this kind can be independent or connected to access control system. Special attention has to be paid to devices that allow to turn a regular mechanical lock into an electromechanical one. 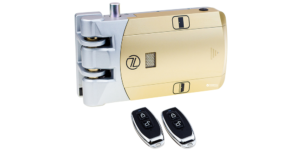 For example, compact autonomous electronic locks by Qmodule. 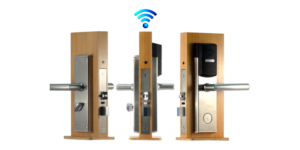 They are installed as additional locks to already installed mechanical locks thus adding wireless access control. Remote control of Qmodule locks is realized via a two-way radio channel at the frequency of 433 MHz with 128-bit encrypting of radio packages. QCONTROL radio network is realized as mesh net with an access points that transmit radio-packages from locks of other radio devices in the net to the server and back. Server on the basis of RPi. *all locks are electromechanic and work with batteries. "iRidium develops in the right direction!" Control Smart Homes from Any Part of the World! Roger Wicks – "iRidium is the only solution for my KNX projects. Why?"